As I walked away, basking in the woman’s kind compliment, I began to think about the many generations of theatre artists who have spent time at our site. Since the early 1960s Barkerville’s streets and buildings have been graced by a legion of historical interpreters who may have spent one single season or, like me, made the place home for years. Many emerging actors have started their careers in Barkerville, and many more have come here as seasoned professionals, ready for a place to settle in for a while. The current President of the Union of BC Performers and Association of Canadian Radio and Television Artists in Vancouver, for example, once played W.D. Moses, the Barber of Barkerville, for a few seasons here before launching a successful commercial film career. A more recent Barkerville “grad” is now the Artistic Director of an up and coming geek-themed theatre company, and is making quite a name for herself as a writer and producer of large scale theatrical events… inadvertently following in the footsteps of yet another Barkerville alum who has spent more than a decade now touring the world with his one-man comedy shows based on the original Star Wars and Lord of the Rings trilogies. A few years ago a nineteen year-old singer came to the Theatre Royal fresh from her first year of training. She spent two or three summers with us, and since leaving the Barkerville fold she has toured internationally with an educational show she wrote about sexual assault. Her play, and her related work, has had a major impact on so many lives; she is using her talent and the professional experience she gained in Barkerville to instigate positive change in the world, all the while maintaining a very successful “traditional” stage career. An old friend of mine spent many seasons working as an actor in Barkerville during the 1980s and 1990s. At various times he was on stage in the theatre and also interpreting the history of mining and early justice. A few years ago he decided to make the big leap of faith that so many actors dream about, and is now living and working in New York City, forging an exciting career for himself on Broadway. Another Theatre Royal alumnus of the late-90s now works with the Cirque du Soliel in Las Vegas, after spending many years a Fringe Theatre sensation. Speaking of… one of our more recent street actors has, since 2007, been touring her own solo show about a Canadian veteran of the Second World War. She too has become a bit of a sensation, both on and off the Fringe circuit, and her work has garnered rave reviews across Canada and in Europe. If you ask her, though, she will tell you that her biggest rewards come from the strong friendships she has forged with so many elderly veterans who are honoured by her sublime work – work that assures them we will always remember their efforts and sacrifice. Much like our work here in Barkerville remembers the efforts and sacrifice of all those who’ve come before us. Not everyone who passes through our site sticks with the acting life. A former “Judge Begbie” interpreter was so inspired by his many years recounting the particulars of colonial justice in British Columbia, he left the world of the stage altogether to purse a law degree. He is now a successful lawyer. A popular, long-time street interpreter is a leading Canadian voice and speech instructor. Others have gone on to pursue medical careers, have become members of the clergy, and teachers. Some cast members have passed away. We’ve seen our share of talent since Barkerville became a provincial heritage property in 1958, and whenever I run into or hear from a former Barkerville performer, they always cite their time in our historic town as a singular and important chapter in their lives and their artistic journeys. And no matter where they go, we will always remember them and keep them in our minds, as part of the story of us… the story of Barkerville. 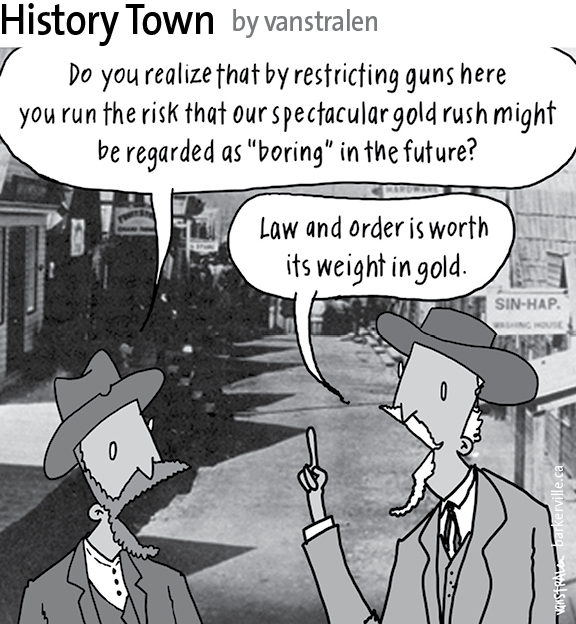 The above one-panel cartoon (originally published June 27, 2015) by Dirk Van Stralen, with accompanying editorial by Danette Boucher, is the fourth of twenty weekly entries that were logged – and subsequently blogged – as part of a 2015 collaboration between Barkerville, British Columbia and the Prince George Citizen aimed at introducing some of the quirkier advantages to living, working, and playing in the Cariboo Goldfields. We hope you enjoy!